Release Effort Variance shows the comparison among the effort that was planned against the actual effort (Spent Hours) from all the tasks within a release. X Axis - shows the last 15 releases. Y Axis - shows the Hours. 2. If the Spent Hours is more than the Estimated Hours, then Effort Variance will be negative. 3. If the Variance is positive then the indicator will be in green and spiked up. 4. If the Variance is negative then the indicator will be in red and spiked down. (in Hours) within a release. 7. 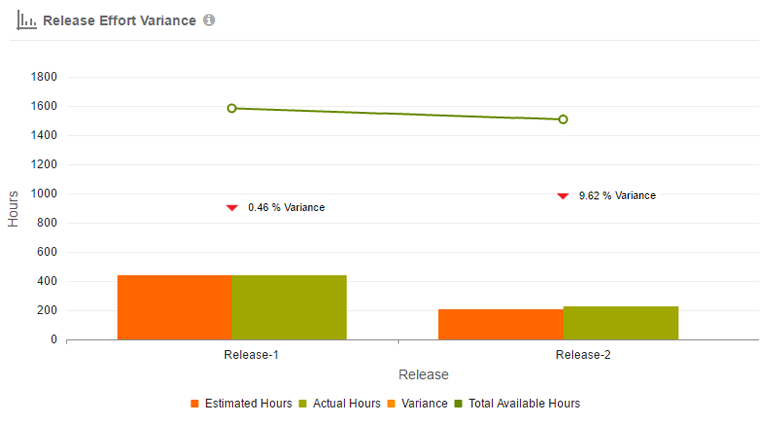 Orange Bar – Total Hours of work estimated by the Team members (in Hours) from all the sprints with in a release. 8. Green Bar – Total Hours of time spent by a Team members (in Hours) from all the sprints with in a release. 9. Green Trend line – It will show total available hours of all the sprints within a release.